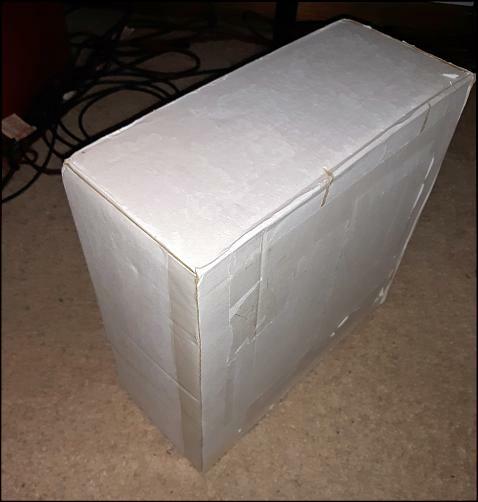 So, I recently purchased a rare bird on greedBay under the assumption that what I was buying was indeed Brand New as the seller had listed it as. Long story short, she arrived at my door yesterday after about three weeks or so, taking the scenic slow boat. 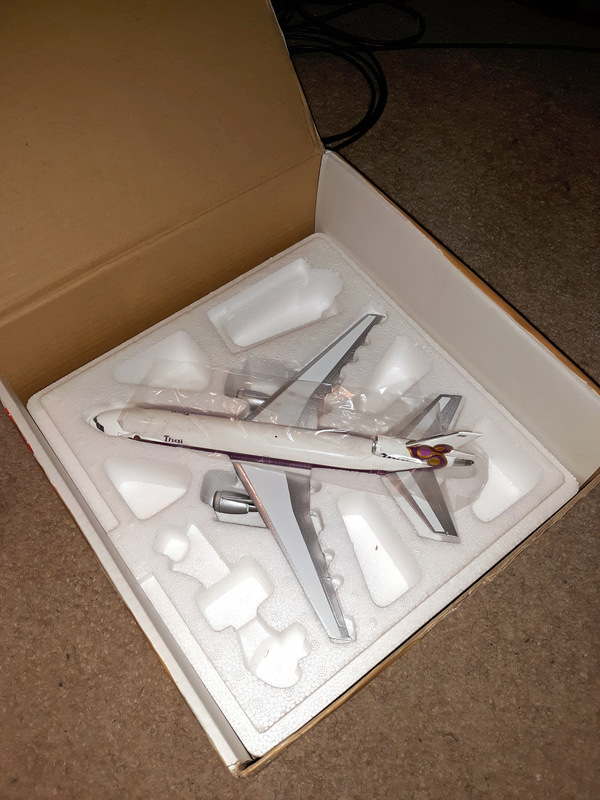 As I was gently using my exacto knife to get through the brown packing tape surrounding the box, it occurred to me that the shipping box was, in fact, the actual white inner box that InFlight uses for its models. In other words, the slip cover is missing and the white box is covered in packing tape/international customs paperwork/address labels, etc. Now, the styrofoam packing inside/limited edition card/aircraft, are indeed Brand New as was stated on the listing, but WTF? It took a few hours for me to calm down and collect my thoughts. I just sent InFlight200 a kind and lengthy description of what happened and have asked them if they could reproduce the slip cover and box for me for an additional cost because this model is way out of production. Hopefully their graphics department/production department can supply me with the materials, since all they would need to do is to bring up the original digital file for the artwork and refab the slip cover, and source another empty white box. If they cannot oblige for any reason (missing original image file/can't print a single piece/yadda yadda), then my next course of action is to contact the seller and arrange for a refund and say good bye to my lovely new addition. What would you do in my situation? I have OCD when it comes to my collection, so not having the complete package is unacceptable. Especially for the price I paid. I know there are those here who could care less about something as trivial as a slip cover, but to me it's a deal breaker. The only photos that I could find of the box were three small photos which I am posting for you. I'm also posting the box as it arrived. Upset is an understatement, but there are supposedly 239 more examples around the globe. Maybe another will show up at some point. Re: Advice Please - What Should I Do???? UGH!! Do you collect models or boxes? A bit stupid taping all over the white inflight box. That would annoy me more than the sleeve missing. Could this have been a "Back Door " sample so no sleeve? Maybe a collector may oblige with a hi-res scan of the sleeve? Last edited by Aussiejets; 04-10-2019 at 08:11 AM. As has been stated before, original boxes in good condition are an integral part of the model, especially in 1/200 scale, and this buyer paid a premium for this model, and a major part was missing. "Do you collect models or boxes" misses the point entirely, and this model has a significant loss of value due to the missing outer sleeve. If the manufacturer can provide you a sleeve, the model is a keeper, otherwise, I would surely return it for full refund (or die trying...). I'm of two minds about this. Obviously, the outer sleeve and box are important, but are not the "be all, end all" to me that they are to some collectors. I don't display my boxes, they are in an enormous, albeit tidy, pile in the corner of our basement storage room. I don't look at them, nor really think about them at all. When it comes time to dispose of my collection, then they will become a factor in the price each model attains. If the OP paid a premium for his model, and expected it to come with perfect packaging, and if this is vitally important to him, then he should return the model for a full refund (or work out a mutually agreeable compromise with the seller). As for the "just wait and the model will be re-released one day", I'm not a huge fan of that view. The OP could be waiting a long time (or not), and he has a perfect, long awaited model in hand. If I was the OP, I would display my model proudly and enjoy it, and not worry about the issue of packaging. But each collector is different. Its ultimately up to him to weigh how important a cardboard sleeve is to him. I can certainly see where the OP is coming from. I have a small collection of mint 1/200 diecast airliners, a few of which have no boxes of any kind. They display perfectly, the resale value of them is not important to me. Personally I’d keep the model. However, if I had the same collecting criteria as the OP, I think I’d return it for a refund if that’s possible. We all collect differently, it’s what makes our hobby so interesting. will decrease in value when they are re released, or enjoy the hobby and not worry about its value. ...What would you do in my situation? I have OCD when it comes to my collection, so not having the complete package is unacceptable. Especially for the price I paid. I know there are those here who could care less about something as trivial as a slip cover, but to me it's a deal breaker. ..
You already made up your mind on the issue, so what is exactly your point and reason for starting the thread? I am confused. Thank you all for the varied view points. This is what I needed to hear. I wrote my OP under a bit of duress and needed cool heads to weigh the pros and cons. Thank you to those who believe my disappointment is valid. And to the question, 'Do you collect boxes?' , the answer is an unequivocal 'Yes.' That is part of the fun of collecting for me. I come from an artist background, so aesthetics is a large part of my collecting criteria. As you can see from the images I found of what the cover should look like, it is a beautiful full color piece of artwork, not the older style design that was pretty much a white cover with the image of the model and a logo. I have made the decision to keep the model, since yes, that is the main reason for collecting. I will need to work out a suitable compromise with the seller about the monetary issue, or it's off to the eBay overlords. Thank you all again for your insight and experience in this matter. I learned something new from this thread. I never knew about the back door items before. P.S., if anyone is interested in the seller's profile name, give me a P.M. I omitted his/her info for privacy. Oh, and one last thing: if anyone has this model with the slip cover, if there is a way that you can have it professionally scanned at a graphics company or perhaps a local Library that has a flatbed scanner, could you scan all sides for me and email me the digital files? I would need the quality to be full color and at least 300dpi. I could then piece the images together into one full image and then try to find a place that could make a slip cover. Since this model is out of production, I don't foresee any problems about duplication. Thanks all. Last edited by DC-10_Tony; 04-10-2019 at 11:26 AM. Seller is easily identified on ebay through a search of sold 1/200 THAI DC-10 models. If it is any comfort, I own dozens of white box models without the the outer sleeve. I personally dont think it plays much into the resale down the road especially if disclosed to the buyer that there is no sleeve. If it is rare and they want the model bad enough they will buy it. Thanks all. I have contacted the seller and am awaiting his response and/or partial refund. 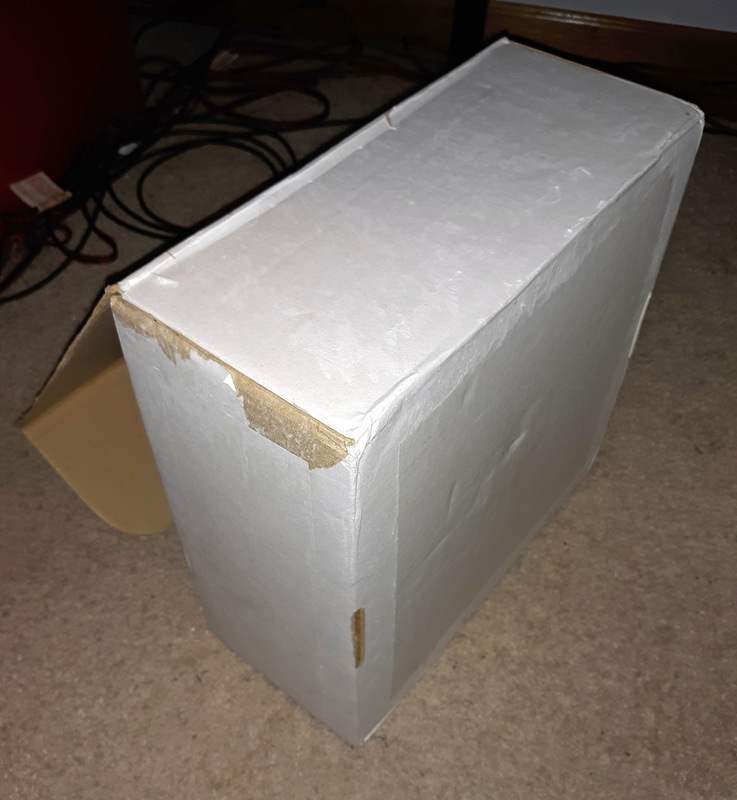 Seeing as the white box is covered in shipping tape and labels, I wonder if there is a way to get a new blank white box from IF? It would be nice if you could. Or maybe someone on here could help you in that regard. Indeed it is. 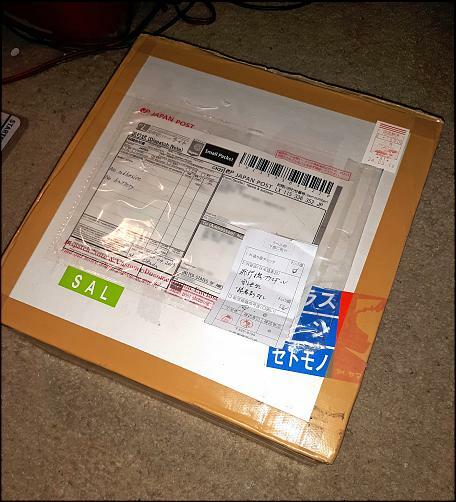 Seller is from Japan, and the box/model here from OP is from Japan. The listing pictures clearly show that outer sleeve is missing. So IMO item is 'as described', and I do not see any recourse for partial refund. OP should have inquired about clearly missing sleeve, if that is such a 'deal breaker' to OP, as evidenced in photos, before pulling the trigger. I would be annoyed by this, but not to the point of returning the model (at least not for a long-sought after, out-of-production one). Seems like you've reached this decision as well. I personally dont think it plays much into the resale down the road especially if disclosed to the buyer that there is no sleeve. If it is rare and they want the model bad enough they will buy it. Agree with crownvic: if there's a model I want, even without a box, I'll buy it. I also just sold a Phoenix Cathay 777-200 in a plain box (disclosed as such), and got a nice premium for it. So I don't think perfect boxes contribute to the value as much as some people think. It's more about the rarity of the plane. And yeah, if it's shown in the pictures that way, I think it's definitely an overreaction to complain about receiving it the way it was shown. You can make an argument that it should be listed as 'Used' rather than 'New' but frankly I don't pay any attention to that on a listing. The photos will tell the story. Same situation with Hangar Club models without the card. If it's not shown in the photos, I'll ask the seller before purchasing, and make my decision to purchase accordingly. Keep it. 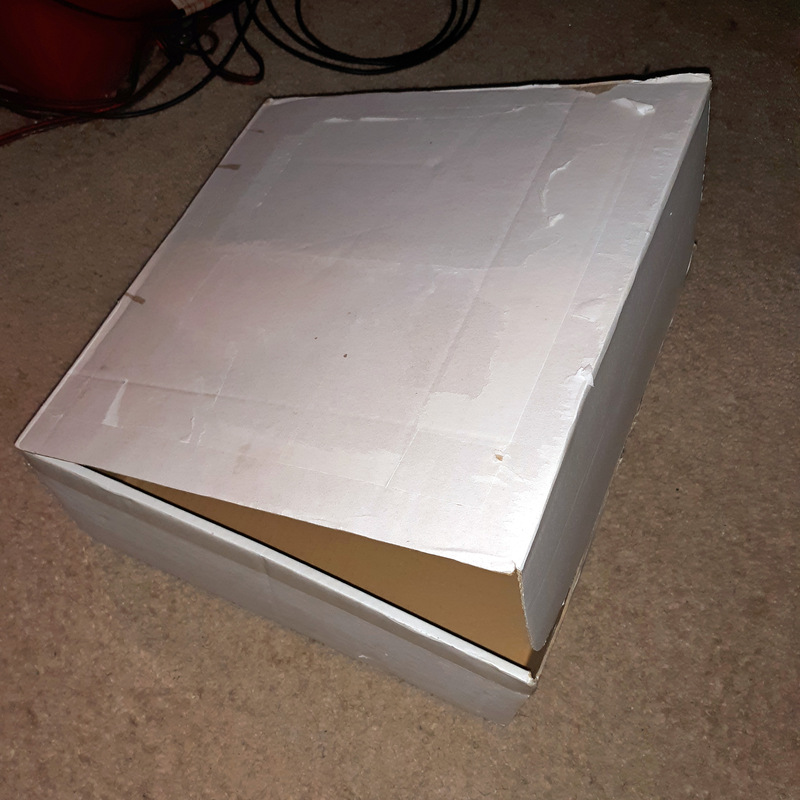 If it were one of someone we know box design, that someone would send you the box cover for free, as that someone has a few here under the bed. But this one was before that someones time. Model is intact? No broken gears, wings, engines, tail...keep it. Theres a lot more going on in this crazy world and far far more serious. Keep it. Shes a beauty. Here below one pic from the sold ebay listing. Again, if sleeve is so important, why OP not inquire with seller before buying, as sleeve is so obviously absent in pix? Furthermore, OP complain about 'slow boat scenic" shipping, looks like seller offered FREE SHIPPING, and inside of 3 weeks shipping from Asia to US is reasonable and normal. Sigh! 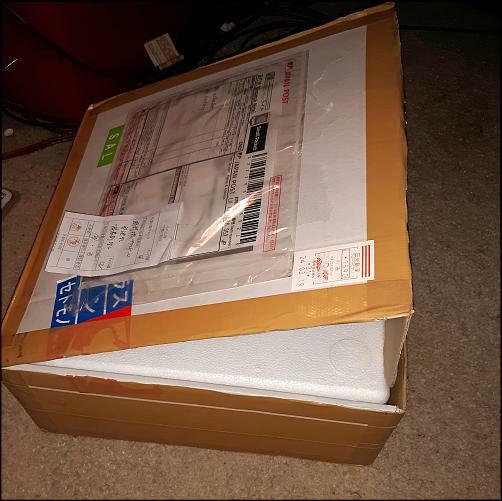 The shipping didn't seem to be a real concern of the original post, what is a concern, and is absolutely reasonable, is when an item is described as "new" the expectation is it arrive as "new", as in unused, in original packaging. If being described as new, with caveats, like "new back door model in generic white box no sleeve" it seems it would be incumbent on the seller to describe accurately what "new" means in the particular case. I see where the poster has concerns. U are correct in an ideal world, but u missed the point. If i was a buyer that considers missing sleeves to be "dealer-breakers", I would immediately shoot an email to seller requesting clarification as it is clearly missing in pictures of what seems otherwise a new model. After all the seller, who has 100% +ve feedback, doesn't seem to hide the fact that sleeve is missing as clearly evidenced by the 3 pictures that are provided. A little bit of xtra leg work would have solved this "issue". What you see is what you get. If not satisfied just send it back. Yeah, I dont think I missed the point, I just disagree, which is fine. Mark something new, and I'm going to assume it is unused, in it's original packaging. Otherwise describe it, and I'll decide if it is an issue.. I dont care what seller rating they have. If it is marked as "new" I dont need to clarify it with the seller, it is "new", unused, intact, as it shipped from the factory, in it's original packaging, "new". You would be a satisfied customer, in this case I wouldn't. Would it upset me like the op? Nah, his money, his issue, hopefully it is resolved to his satisfaction. For me, the issue would not be the fact it didn't have the decorative outer sleeve. It would be the fact it wasn't double boxed for shipping and instead the seller merely applied tape to the edges of and applied shipping labels to the white box and sent it on its way. To me, that's unacceptable, especially given the distance the model had to travel and the length of time it spent in transit. I second this. The packaging (or lack of it) is outrageous for a model at this price. Would justify a bad rating alone for that. I would keep it, if I really wanted to add the model to my collection but if you really want the model to be 100% with all the packaging as you clearly are then I can imagine your worries. Hope you get this sorted out. Right? I'm surprised it didn't arrive with some damage to the model. He's lucky! I third this. I had a similar experience from a big-time seller on eBay in China. When I got my model, he had just wrapped brown paper around the model (and sleeve) and taped it up, no shipping box, no padding. Of course the box was dropped very hard somewhere enroute and one corner was badly dented, enough that the model inside was damaged. 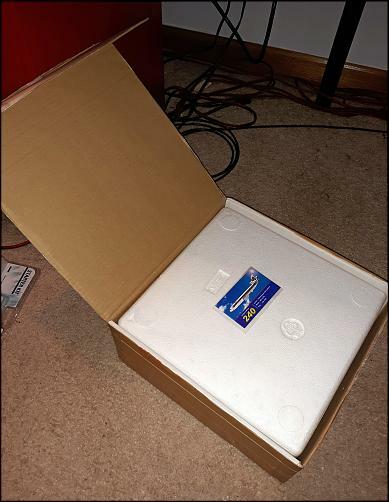 I am never going to buy from that seller again. To OP, I get it and used to be very picky about the planes and boxes. I have become a little less so over the years, but this is unacceptable. The seller was trying to save you on shipping cost (maybe), but I would rather pay a little extra to get a model and its original box and sleeve placed in a bigger box with some packaging. I have received one sopping wet from the UK and have seen pics of Amazon just slapping a shipping label on the outside of the original makers box! Also received them smelling light mold, smoke and with remnants of food on them. I do collect boxes also and if I go to sell a plane I can expect to get more from most collectors if the box is in good condition. 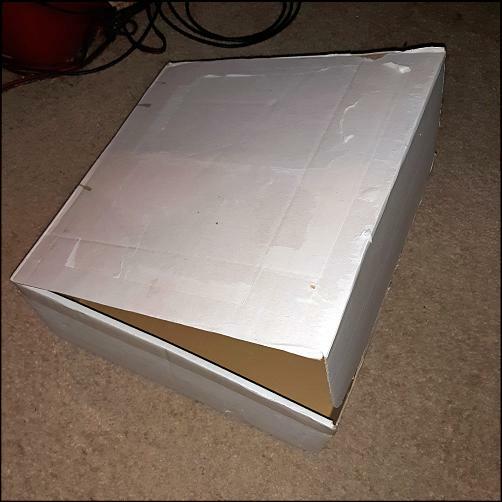 As an example I sold a 1985 Nike Air Jordan Box in great condition (box only) for $250 to a huge Jordan fan in Chicago. So boxes do matter! Don at Jetstreams has provided sleeves for sold out models in the past...good luck now though with Jodi supposedly running things! Last edited by jcahea; 04-10-2019 at 07:33 PM. Wow! Thank you all for the great debate this has become. Maybe this is a great thread for those new to the hobby, or to be aware of the occasional pitfalls of doing business with sellers who are not fully truthful. When I purchased this model, this same seller had two of them prior. Mine, and another one marked as "used" and indeed was listed as such. For the record, the used one sold for more than I paid. The screen capture provided above does not reflect what I paid. I made an offer behind the scenes for much less and the seller accepted. 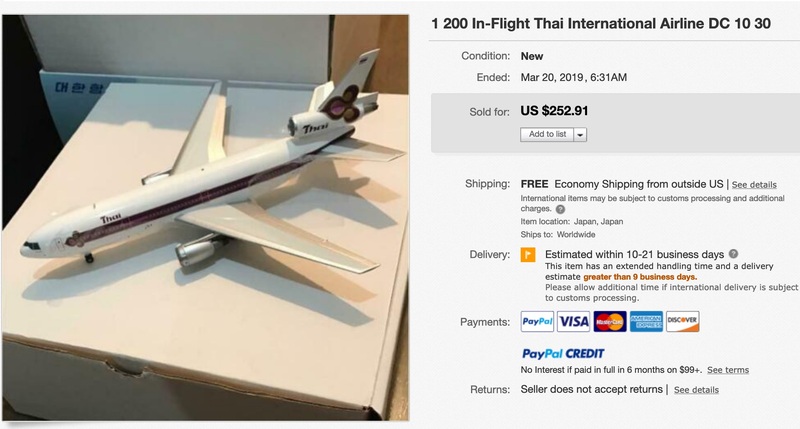 Regardless, I am happy to announce that I was given a substantial partial refund and am a proud owner of a rare Thai DC-10-30. About getting a new replacement box, I have already contacted InFlight, but haven't received a response yet. Perhaps someone here has a spare?? Feel free to contact me if you do. I'd be happy to make a deal! T7 4ever, yes that is her! Anyway, after about an hour I was able to slowly pull off the packing tape and shipping labels. Here's the result. As expected, the glue from the tape took with it the top layer leaving the soft fibers exposed underneath. Full tearing was minimal as you can see by the brown patches where the white fibers completely tore off. Meh, I guess it's as good as it's gonna get. I still hope someone here finds this thread and is able to scan their slip cover for me in high resolution. No flash photography because that leaves horrible glare from the flash, rendering it useless. Cheers. Hey Tony, I know ARD in London have a big collection of spare sleeves they sell for £1 each at fairs. Might be worth getting in touch and seeing if they have one for your model? Good to hear you got some redress. The description should never have said new and the missing sleeve also mentioned... and finally, they should have wrapped the entire box in brown paper and then stuck the shipping documents on that. Or better still, put it in another box with packing material. I am surprised the problem is from a Japanese seller. As I understand, collectables as a hobby is very big in Japan and collectors there can be picky right down to the condition of the box. Really?! Thanks for the info. I will definitely contact them. Thanks. Yeah, you are right. 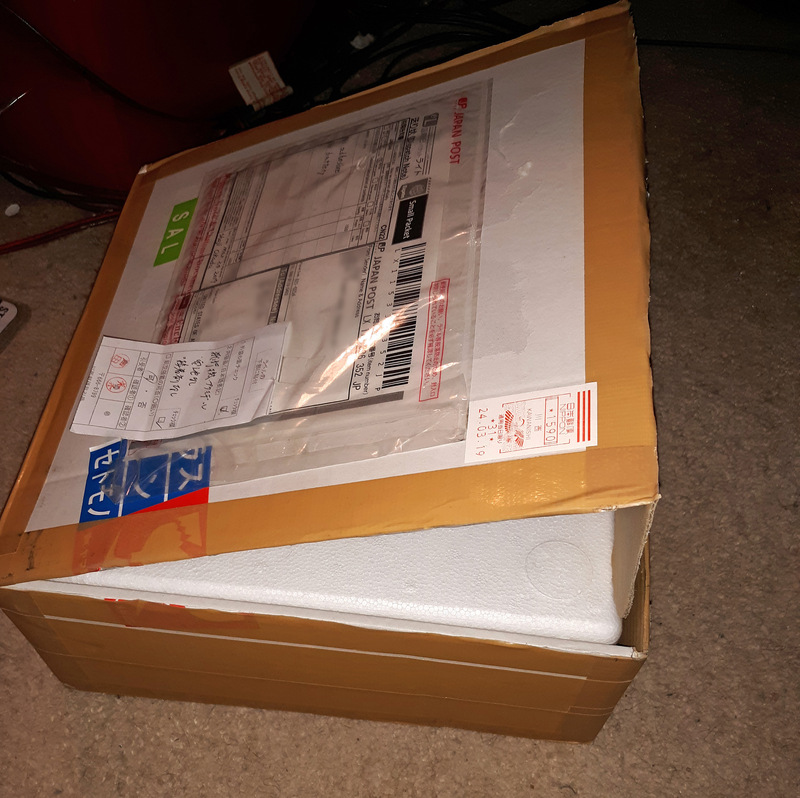 Everything I've ever bought from Japan has always arrived as protected as possible. Especially my Macross collection. Others here have made me aware of "back door" items which I've never heard of before, so that's what I believe is the case here. Lesson learned.